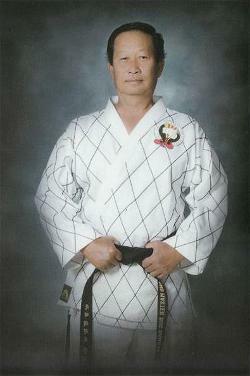 Grand Master Dang Huy Duc has over 54 years of martial arts training experience. He has successfully trained thousands of Tae Kwon-Do martial artists, with many of them having become National or World Champions. Grand Master Dang Huy Duc is a highly regarded figure in the world of martial arts who has spent more than five decades honing his expertise in Tae Kwon-Do. He has studied with some of the most renowned martial artists across the globe (e.g. Great Grand Master Nam Tae Hi, Grand Master Kwak Byung Oh). He used the skills and knowledge he gained to found one of the largest martial arts schools in the United States and to formulate his own philosophy of Tae Kwon-Do. His learning began when he commenced training in Kung Fu as a teenager. Soon, he moved on to study basic Tae Kwon-Do techniques under Great Grand Master Nam Tae Hi. Under Great Grand Master Nam Tae Hi, who is known internationally as “The Father of Tae Kwon-Do in Vietnam,” Grand Master Dang Huy Duc progressed from the entry level white belt to a black belt rank. He attributes his later accomplishments in martial arts to the strong mental and physical foundation that he developed under the tutelage of Great Grand Master Nam Tae Hi. 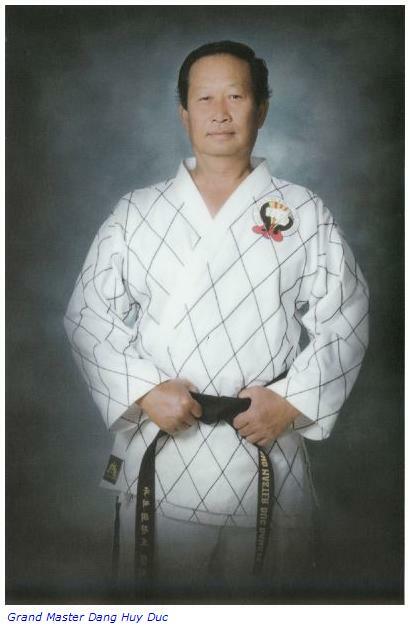 On the basis of his demonstrated skill in Tae Kwon-Do, Grand Master Dang Huy Duc was accepted as a student of Grand Master Kwak Byung Oh, a former Grand Champion of Korea. With the guidance of Grand Master Kwak Byung Oh, he added high level free sparring techniques and strategies to his already impressive repertoire of martial arts skills. Around this time, he also began to attend seminars by the revered founder of the International Tae Kwon-Do Federation (ITF), General Choi Hong Hi. These seminars further refined Grand Master Dang Huy Duc’s techniques in the style of General Choi Hong Hi and the International Tae Kwon-Do Federation (ITF). Grand Master Dang Huy Duc’s commitment and perseverance paid off, and he won the title of National Tae Kwon-Do Champion in Viet Nam in 1966 and Asian Tae Kwon-Do Champion in Hong Kong in 1969. Inspired to give back to the Tae Kwon-Do community and nurture young martial artists, Grand Master Dang Huy Duc opened a school in Vietnam to pass along the wisdom he had gained from his martial arts teachers. His martial arts school in Viet Nam proved a resounding success, and in 1975 he immigrated to the United States and founded another school. Drawing on his expertise as a martial artist and his experience in Viet Nam as a teacher, he propelled this school to even greater heights. 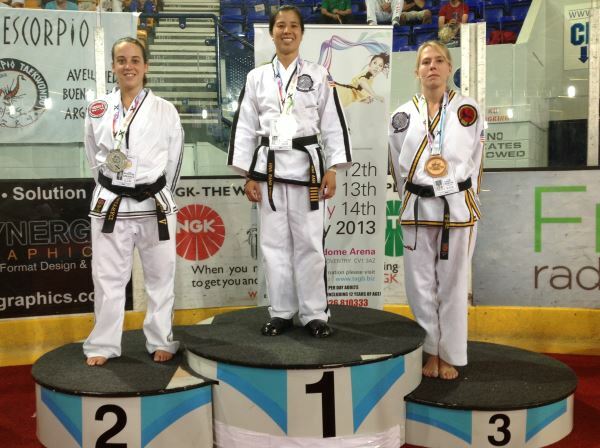 Today, it is one of the largest and most respected schools of martial arts in the country. The foundation of the school’s success is its emphasis on Grand Master Dang Huy Duc’s philosophy of Martial Arts. This philosophy, which Grand Master Dang Huy Duc embodies in all aspects of his life, maintains that martial arts are best understood as something much more than a means of self-defense or merely physical training. For him, the study of Tae Kwon-Do is about the unity of body and mind, perseverance, and an unwavering martial arts spirit. These underlying values mean that studying Tae Kwon-Do at Grand Master Dang Huy Duc’s school not only strengthens the body, but also improves one’s mind and character. Despite his many achievements including recognition as a ninth degree black belt by the International Tae Kwon-Do Federation (ITF) and the World Tae Kwon-Do Alliance (WTA), Grand Master Dang Huy Duc exhibits unparalleled modesty and humility in keeping with his philosophy. 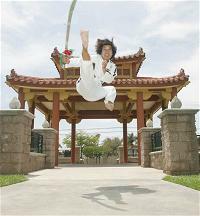 He emphasizes that the primary purpose of training in Tae Kwon-Do is the journey of self-improvement and wisdom. Although the techniques learned in Tae Kwon-Do are invaluable when a person is forced to use physical means for self-defense or to defend others who are in need and defenseless, martial arts should be employed only with serious forethought and never from a desire to hurt others. Likewise, Tae Kwon-Do should not be used as a means to show off one’s physical skill. This would be contrary to the noble spirit for which one strives through the unity of body and mind, which is the central goal of training. Grand Master Dang Huy Duc also recognizes that this journey is different for each person. He tells his students, “No one is perfect, neither mentally nor physically. Everyone has flaws, and everyone has strengths and weaknesses. The goal is to realize our abilities, weaknesses, and imperfections so that we can grow from them.” Following this philosophy, students of martial arts can work toward becoming the best possible version of themselves by overcoming weaknesses and becoming healthier, stronger, and having sharper of body and mind. Working toward this goal also demands a high level of commitment and persistence, and training in Tae Kwon-Do helps to foster these qualities. All martial arts require consistent practice and a strong basis of the fundamental skills that serve as the foundation for all higher-level techniques. Grand Master Dang Huy Duc envisions the teaching of the fundamentals of Tae Kwon-Do as the planting of a seed, and the student’s persistent devotion to strengthening those fundamental skills as water and fertilizer. A gardener who tends to his or her seeds well, watering them and adding high-quality fertilizer with consistency, will see those seeds grow into strong plants. This growth occurs organically. The gardener does not have to worry about the shape that the plant will take. As long as the gardener fulfills his or her role, such matters take care of themselves. Likewise, the student who is committed to the study and practice of Tae Kwon-do will grow into a skilled martial artist. Eventually, the student must carefully study the smallest details of each technique demonstrated by others, work to comprehend the intricacies and purpose of every motion, and accurately reproduce each technique thousands of times—but the result of natural growth is the same. One will learn that being a good student is not easy, but the challenge is part of the process of achieving and maintaining a strong, unified body and mind. With time, students of Tae Kwon-Do discover that they have achieved a wide range of benefits including confidence, mental toughness, balance, agility, flexibility, and strength simply by their dedication to training. Individuals who maintain their dedication for many years can achieve a special state of self-control, but this is possible only when one remains humble. Humility is one of the great values in Grand Master Dang Huy Duc’s philosophy. He continually reminds his students that no matter how skilled they become, there will always be someone who surpasses them in speed, strength, and form. This person might be a fellow student, a higher-ranked martial artist, or an elder. Rather than focusing on status, one should look to those who are more skilled as a source of wisdom about Tae Kwon-do, the martial arts in general, or even life itself. This attitude of humility and respect lends itself to self-improvement, allowing even an expert like Grand Master Dang Huy Duc to continually learn and grow. Focusing on the self and practicing a humble perseverance will, over time, turn even the most uncoordinated student into a martial artist with a unified mind and body. In this state, Tae Kwon-Do techniques become second nature. They can be performed precisely yet instinctually, with the body firm yet fluid in motion: the hallmarks of self-control. To achieve this goal, Grand Master Dang Huy Duc puts a simple equation of 2+2=4 at the center of his teaching and lifestyle philosophy. In this respect, Tae Kwon-Do practice and ordinary human life is equalized to easy but compulsory arithmetic requirements. In other words, he teaches the students that when they perform any movement, the mechanism or algorithm of its performance has to be identical for every student. With each new practical lesson, students are training their mind to perform the techniques accurately, and eventually make it a reflex reaching a hundred-percent accuracy where 2+2=4. The strategy is a perfect way to balance yin and yang of any human, namely, physical and mental strength along with light and dark sides of one’s personality to enable an individual to understand and manage their interconnectedness consciously and for the best outcomes. Thus, the state of self-control implies the unity of the mind, including both mental and the emotional domains, with the body, with each element in proper balance and under control. Achieving self-control gives one an advantage not just in Tae Kwon-Do but also in all areas of life, including the professional, academic, and personal. It serves as the basis for an unshakeable self-confidence and commitment to achieving one’s goals. Learning Tae Kwon-Do also serves as a model for other areas of study or training, as becoming an expert in any subject requires establishing a solid foundation and then building upon it with humility and a keen awareness of one’s strengths and weaknesses. Such an approach trains student’s mind to stay on the right track and further transit into the other areas of their personal and professional life in terms of building good habits and attitudes while spreading these beliefs at home, school, and the community at large. Therefore, the philosophy of Tae Kwon-Do that Grand Master Dang Huy Duc teaches is the key to achieving a noble spirit through unity and self-control, empowering one to unwaveringly pursue life goals, stand up for oneself, and fight for what is right. Martial Arts is a way of life that cultivates a noble spirit, a sense of self-discipline, and physical fitness. The principles of Martial Arts can be applied to all aspects of life. For any area of specialty, we need to develop a solid foundation and genuine competency at an advanced level. Thus, we will have self-confidence and awareness of our weaknesses and strengths, in order to improve and progress in our area of specialty.